Daniel Boulud has a whole slew of restaurants all over NYC, and this is his newest addition. It was so thoughtful of him to locate it just steps from our apartment on the UWS. The menu is mainly Mediterranean, but it’s pretty extensive so I’m sure anyone could find something they liked. The atmosphere is modern/minimal, and is more appropriate for a business dinner than a romantic date. The food was absolutely spot on. You must, must have the fried artichokes – I’m still dreaming about them. We all (there were 4 of us) had different fish dishes and they were all exceptional as well. Do yourself a favor and forgo dessert and just go around the corner to Epicerie Boulud and have the most incredible chocolate chip cookies (or one of their other amazing treats) and enjoy the views of Lincoln Center at night. I don’t have too much to say on this one – it just didn’t live up to the hype for me. The restaurant is pretty large, and was only half occupied when we went. Granted it was on the early side (7ish), but the people there seemed like tourists – not a great sign for a NYC restaurant. We found shell (lots) in our crab appetizer, the entrees were so-so, and the dessert pairing of peanut butter pie and lemon granita was just gross. On a positive note, the fries were pretty awesome (they waiter told us they’ve actually won awards for them). Don’t think I’ll be rushing back anytime soon. This is an awesome “white tablecloth” brunch. It’s not necessarily where you want to be nursing a hangover, but it is delicious, fresh and just fancy and fun for a weekend morning. There is a price fix menu that lets you choose 2 courses. I think this is just plain genius since I usually spend a lot of time trying to decide if I would rather have something sweet or savory for brunch – now you get both! Do not miss the bread basket, it’s probably the best selection I’ve ever had. Oh Milos, how I love thee! 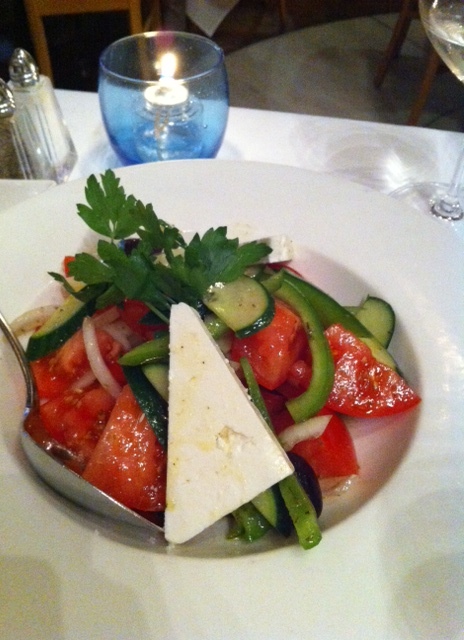 We have been going to Milos for years and years, and it’s still my most craved restaurant – and that’s saying a lot! The restaurant is this beautiful open space that makes you feel like you’ve been swept out of NYC and dropped right onto the Greek coastline. The food is well, crave worthy. If you like Greek food, you must try this place. They are known for their tomatoes, so start with a tomato salad (it’s seriously bizarre how their tomatoes taste amazing even in the dead of winter), then have the Milos special to share as well. It’s thinly sliced/fried pieces of zucchini and eggplant piled high around the most delicious tzaziki. Oh, and the chunks of fried cheese on the side aren’t bad either. Then you have your choice of seafood, which is all laid out beautifully on ice for you to see. My husband and I generally split one serving of dover sole, which is plenty when paired with everything else. 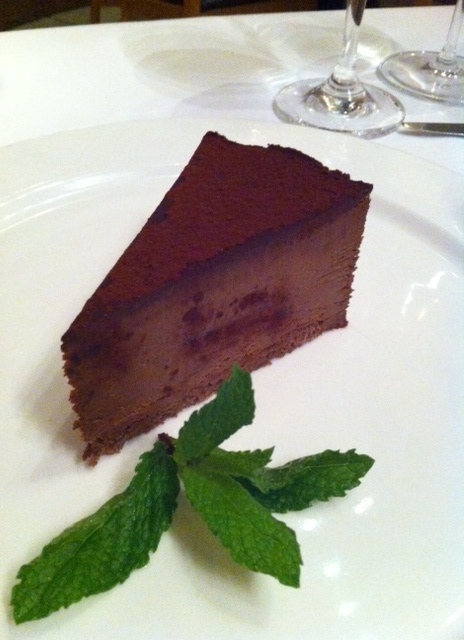 Finish with a piece of chocolate mousse and you have the most scrumdidliumptious dinner ever. A bit of warning though, that the seafood portion of the meal will not be easy on your pocketbook. And the waitstaff definitely errs towards the pretentious side. Just be aware of this going in. Not necessarily rude, but not overly nice either – unless you are ordering for 10, expensive bottles of wine included. None the less, this is probably our most frequented restaurant in NYC and would be a great place to go to before a show as it’s not too far from the theater district. Steakhouses in NYC are practically as rampant as bodegas, but in truth, most are pretty excellent and will put your local Ruth Chris to shame. QM has a great decor – walls of wine bottles and a labyrinth type layout that is rather interesting to navigate. It has a trendy edge, but given the location, it will be packed with suits at 7pm on a Tuesday. The steak we had was amazing, and they make the steak sauce table side (it was excellent and unique as well, but the steak on its own was so good I didn’t even think it needed any sauce). They really pay ice cream its due in the dessert section and offer a ton of different flavors as well as house made ice cream cakes. Yum! Posted in Restaurant Reviews and tagged New York City, Restaurants, Reviews. Bookmark the permalink.